During late August of 1999, we were fishing typical late summer locations for big walleyes around deep water structure in the main lake basin. We located fish using big bottom bouncers and spinner harnesses tipped with crawlers. We trolled until we found fish and then depending on whether they were concentrated or scattered, we either vertical jigged or kept trolling respectively. We were experiencing average volume for medium sized walleyes in 20 – 30 ft. and had pulled a few big ones from 35 – 40 ft. A hot weather system settled in, the wind went flat and over the course of the next few days our production plummeted. On the third hot flat calm day in a row, I could see other guide boats moving from spot to spot in the distance and I knew they were struggling as well. As I thought about what to try next, I remembered a pattern that had worked for me many years before. As the summer comes to an end, the cabbage weeds die off and the bait fish that had been hidden in them are suddenly left exposed and vulnerable to hungry game fish. I motored onto a nearby sand flat that had been home to thick weed beds that Summer. 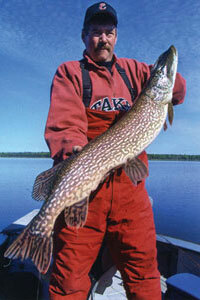 The area had been a big pike hot spot, as the sand flat was relatively close to the deep water of the main lake basin. As we trolled slowly into the bay on mirror flat water under a blazing sun, I noticed several floating mats of dead and decaying weeds. We began trolling in 12 – 16 ft. of water and immediately caught fish. As we worked shallower we caught more and by the time we focused on the 6 – 8 ft. range we had caught more 2 – 7 lb. walleyes in 3 hours of fishing than we had the previous week combined. The next Summer warmed quickly and many walleyes had moved out toward the main lake basins by mid July. After getting smoked one blistering Hot calm morning, I met up with the rest of our group for shorelunch. Expecting to hear similar grim stories, I was shocked to hear that two of my rookie guides had each managed to put over 50 walleyes aboard, including 2 over 9 lbs. A warm high pressure system had moved in and with the lack of any wind, I had concentrated on the mid to deep water structures of the main lake basin. Standard procedures, right? One guide had switched to walleye gear after his guests hooked several walleyes on pike spoons in a shallow weed bed. They trolled the deep edge of the weed bed with spinners and later pitched jigs up into the weeds with great success. The other guide had started experimenting with shallower water by 9:00 AM and by 10:00 AM his guests were pitching jigs and twisters on top of rock piles and were catching aggressive walleyes as shallow as 4 ft. Conditions were similar to those we had experienced the previous Aug., it was the 3rd day of super hot weather with almost no wind. Since that day, we have experienced this phenomenon dozens and dozens of times throughout the Summer months. I would like be able to “pat myself on the back” and explain why the fish were there and why they were aggressive, but to be honest, I have no idea. One of my guides speculated that the surface can be viewed from a walleye perspective, as a type of “edge” and under flat calm conditions this may be the case. This pattern probably occurs on other walleye waters as well, but the Lac Seul Summer shallow water bite is the most dramatic that I have experienced. What I do know for sure is that when it gets hot and flat and my basin bite shuts down, I always check the shallows, and more often than not it has saved the day!